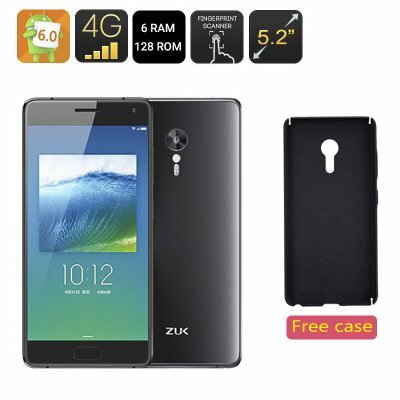 Successfully Added Lenovo ZUK Z2 Pro Smartphone- Android 6.0, Snapdragon 820 CPU, 6GB RAM + 128GB Memory, 5.2 Inch HD Screen, 4G (Black) to your Shopping Cart. The ZUK Z2 smartphone comes packed with all the latest functionality and smart features. From Android 6.0 and 4G to built-in blood oxygen and heart rate sensors, a fingerprint scanner and USB Type-C port. Get the most out of Android with Android 6.0 - a powerful user friendly interface that will let your explore Google Now on Tap, a redesigned app drawer, 200 new emojis and more. Check out the Play Store for apps and games and browse the web or enjoy your media on the 5.2 inch HD screen. 4G connectivity ensures that your browsing will be smooth and your downloads fast. What's more, you will have two SIM card slots to fully enjoy great connectivity. The ZUK Z2 Pro comes with a fingerprint scanner - a quick and secure way to unlock your phone and keep your private data safe from prying eyes. Running on Qualcomm Snapdragon 820 64bit quad coreCPU with 6GB of RAM, the phone is a true powerhouse. You can benefit from fast operation speeds and easy multitasking. With Adreno 530 GPU, you can also indulge in great gaming. With 128GB of internal memory, you get loads of storage space for your media and other files. The 3000mAh battery makes for 8 hours of non stop talk time + 48 on standby. An interesting addition to the ZUK Z2 Pro 4G smartphone are the two built-in sensors: heart rate and blood oxygen. You will be able to keep an eye on your pulse and oxygen saturation. The ZUK Z2 Pro Smartphone comes with a 12 months warranty, brought to you by the leader in electronic devices as well as wholesale Android Phones..